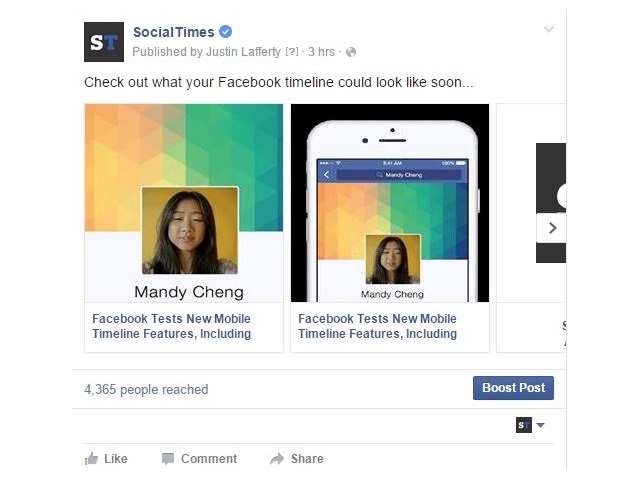 Facebook Testing Page Posts With Carousel Format? Facebook appears to be testing the use of a format similar to its carousel ads for non-advertising page posts. SocialTimes editor Justin Lafferty was given the option to choose multiple images for this post, with the images linking back to the selected post on SocialTimes. Choose images from this website to include in your post, or upload your own. Each image will link to the website. While having the images link directly to their respective website is a helpful tweak, Facebook users are no longer able to click on the images to see larger versions and download them. The carousel page post format was also seen on this post by Facebook Translations Team. Facebook had not responded to a request for comment by the time of this post. Readers: Have you seen any similar page posts?